Do you feel your negative thoughts are spinning out of control? The inner critic is so loud that it’s hard to turn the volume down? Everyone has a personal tormentor living inside their head. And the strangest thing is that we let him be there all the time. Criticizing, blaming, judging, labeling, making someone wrong — this is what you do to yourself or others. What if I told there is a way out? 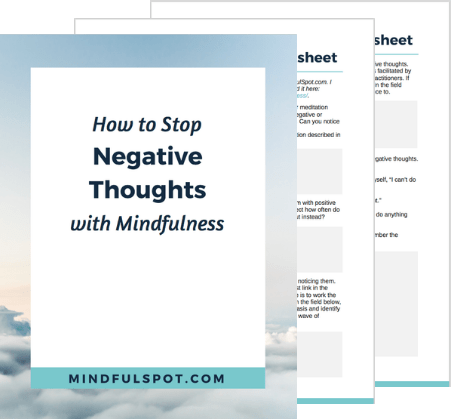 What if I told you that mindful approach handles negative thoughts in such a way that you’ll be able to deal with them anywhere and anytime beautifully? If you want to learn how to stop negative thoughts the first thing to do is to notice them. But when we live on autopilot, immersed in our daily activities, we hardly ever have time just to stop and be aware of what’s going on in our heads. For example, I used to wake up with a heavy feeling every morning. Everything seemed meaningless: getting off the bed, brushing my teeth, putting on the clothes, eating breakfast, going to work. Looking back, I now see how negative thoughts about going to work were making me unhappy. It might sound strange, but I wasn’t really aware of these thoughts because my subconscious masked them as normal. Now I can recognize them easily. How? Through daily meditation practice. So if you want to deal with negative thoughts the first step is meditation. In the very beginning being aware of your thoughts may lead you into a trap. 1. Trying to control your thoughts. How many times have you caught yourself trying to control or suppress your negative thoughts? I’m raising my hand about a thousand times right now. One of the things I used to tell myself, “Just stop thinking about it, you’re probably imagining the worst-case scenario” or “I’d better stop thinking about this, or I’ll go crazy.” Sounds familiar? That tactic doesn’t work because when you try to stop a negative thought, you’re not stopping it, but thinking more about it and giving it more power over you. If you can’t stop your thoughts, then you might try to substitute them which leads to the second trap. 2. Trying to replace negative thoughts with more powerful positive thoughts. For example, instead of thinking how I hated my job, I would try to think about the money I was making and how it would help me stay independent while I pursue other goals in my spare time. When I finally quit my 9 to 5 and started a “new chapter,” it didn’t turn out to be all that great. I’ve encountered plenty of new challenges and problems. You can’t always think positive thoughts no matter how hard you try. Just when it seems that bad stuff is finally over something else comes up and gives you new things to complain or feel bad about. So what to do then? Read on to find out. If you want to catch your negative thoughts, you need to be proactive, so to speak, and find what triggers them. But how do you do that? I say observe your negative emotions and reactions around specific activities, places, and people. You can think about it as a chain that looks like this: thought -> emotion -> reaction. Most of the time we’re not aware of the first link in this chain. For example, how does it feel when you’re stuck in a traffic jam? Are you frustrated, angry, impatient? Can you recognize thoughts behind these emotions? What about your place of work? Do any of your coworkers make you behave or react in some way or another? By pinpointing triggers, you can train your mind to be more conscious of negative thoughts. You might ask, “What exactly does it mean to accept your thoughts?” Even though it sounds simple, the act itself is not. I would explain it as being comfortable with every negative thought that pops up in your head and letting go of the need to label it in any way. Put a conscious effort to be with your negative thought and realize that it’s not that threatening. It’s just a thought. If you can’t accept it, then accept the fact that you can’t accept. Once you’ve done that, you’ve won half the battle. It’s all that needed. Just practice acceptance whenever possible. It will eventually help you change your perspective on the true nature of negative thoughts. By doing this, you can see that it’s only a thought, it’s not you. The thought loses its power to draw you in completely, and you become more aware of your thinking patterns. Try this exercise in relation to your own negative thoughts. Also download this free worksheet to implement the process described in this article.